The Supreme Sleep back support cushion from Delta Baby with a width of 30 cm ensures that your baby sleeps in the safe supine position without unintentionally turning around. The slightly rising base consists of viscoelastic foam in the head area, which ensures optimum pressure distribution. This prevents the head from deforming and your baby will have a comfortable lying position. The flexible side rolls that limit the sleeping area give your baby the familiar feeling of being in mum's stomach, which can lead to better sleep, especially during the first weeks of life. 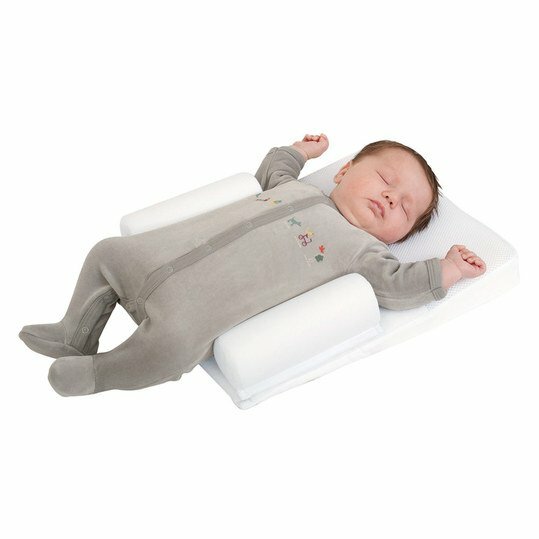 The side rolls can be positioned as desired using Velcro and hold your child gently in the supine position. The Supreme Sleep back support cushion is made of air-permeable materials that ensure good air circulation. You can also use the comfortable positioning cushion without side rollers and use it without any problems in small beds or prams. The cover is removable, can be easily cleaned in the machine and dried in the dryer at low temperatures.